Nothing is better in the fall and winter than the smell of apples cooking in the oven. When baking apples I like to use a variety that maintains its shape such as Golden Delicious, Jonagold, Granny Smith, or Braeburn. 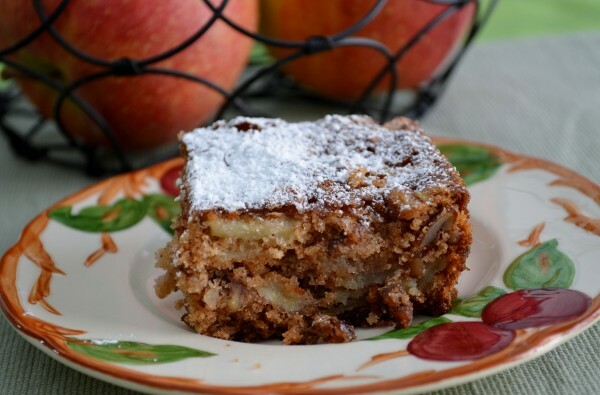 This recipe takes advantage of that characteristic with slices of apple in the cake. 1. Stir together first 4 ingreadients in a large bowl until blended. 2. Combine flour and next 3 ingredients; add to butter mixture, stirring until blended. 3. Stir in apple slices and 1 cup nuts. Spread into a greased 13 x 9 inch pan. 4. Bake at 350 for 45 minutes until a wooden pick inserted in center comes out clean. 5. If desired, spread with cream cheese frosting or sprinkle with powdered sugar. 1. Beat cream cheese and butter at medium speed with an electric mixer until creamy. 2. Gradually add sugar and salt, beating until blended. Stir in vanilla.